Water is essential for human survival. Did you know that the US Environmental Protection Agency (EPA) found over 80 contaminants such as chlorine, e-Coli, and lead in water? That was in tap water. So just think about what is lurking in outdoor streams and standing ponds. As such, it is important to get yourself a water filter to ensure that the water you and your family drink is completely safe. 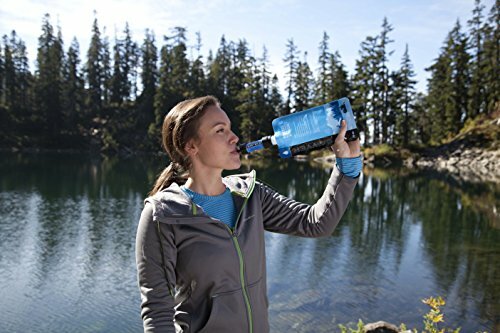 Portable water filters are great when hiking, travelling or camping. They remove impurities in water by lowering the contamination using a fine physical barrier. You can turn that standing pond into a viable drinking water source in no time at all. This post will review the best portable water filter systems that you can find in the market. • A filtered water bottle is an ideal portable source of clean drinking water. This bottle has a built-in filter that purifies the water before it reaches your mouth. 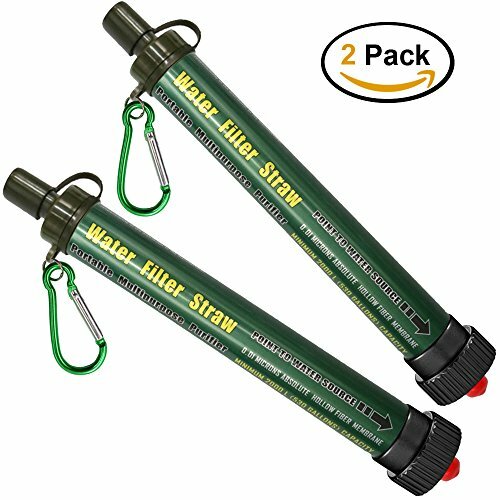 • Water filter straw: It acts just like a straw, but the water is purified before it gets to your mouth. • Pump-style water filter: This filter purifies water by using pressure and an array of filters. It cleans out the water quite effectively. • Portability and weight: When you are choosing a water filter, you have to consider its portability. The ideal one should have a lightweight design and it should be easy to carry, especially if you love hiking and camping. • Effectiveness: A portable water filter’s effectiveness is measured by its ability to clean drinking water. You should get a water filter that has the most functional filtration system, which can eliminate harmful bacteria and protozoa from the water. • The cost: Before you venture into the market to get yourself a portable water filter, set a budget limit so that you can get yourself the ideal product at a reasonable price. • The wait time: Water filters clean a particular volume of water after a specific time. Therefore, you should get yourself a water filter that has a minimal wait time. You can establish the wait time by looking at the product’s specifications. • The filter medium: Different water filters have different filter materials. The effectiveness of each is greatly determined by the filter medium each has. There are ceramic filters, fiberglass filters, silica filters, and hollow fiber filters. • Other factors to consider include the amount of water, the micron size, and maintenance needs of the portable water filter. 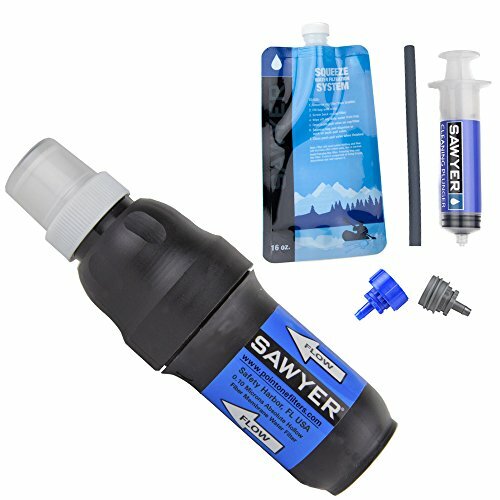 If you are looking for a portable water filter to undertake your camping or hiking endeavors with, you might want to consider the Sawyer Products 0.1 Micron Water Filtration System. 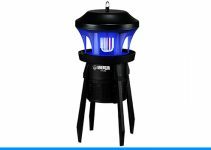 This product has an effective filtration system, and you can use it to clean water in little or no time. The filter does not require pumping or use of chemicals to purify water. It simply operates through gravity flow. You can get either the SP161, which comes with one 2-liter bag, or the SP162, which comes with two 2-liter bags. 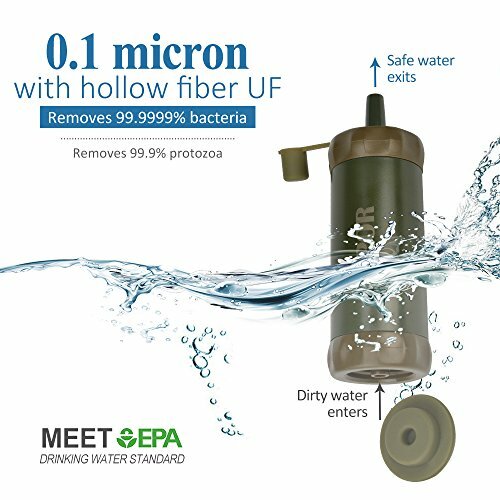 The Micron Water Filtration System is fitted with a hollow fiber material that ensures it filters sediments, cysts, bacteria, protozoa, and other contaminants. Additionally, its lightweight design makes it easy to carry around. In under 1 or 1½ minutes, this water filter will give you 2 liters of clean drinking water. You also don’t have to worry about its longevity because it comes with a manufacturer’s limited lifetime warranty. Additional features that come with the filter include a quick-release hose adapter, a drink tube, a detailed instruction book, and a faucet adapter. • Doesn’t rely on chemicals or any other medium to purify water, just gravity. • After some time of usage, it may become clogged. This product from Sawyer is one of the most reliable filtered water bottles. If you are embarking on your usual camping trips or backpacking, you might consider getting yourself the S3 Purifier. This product cleans drinking water in 10 seconds to rid it of bacteria, chemicals, viruses, pesticides, heavy metal, and protozoa. The S3 Purifier features a 0.1 micron filter and an excellently designed foam membrane. These features ensure that the water filter minimizes the contaminant levels in drinking water. It has a 99.99999 percent bacteria removal rate. It also improves the taste and odor of water. Its membrane is also replaceable after 400 uses. 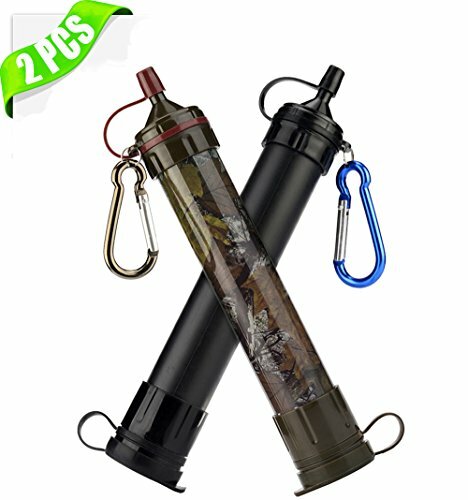 You can rely on this portable water filter for a wide range of activities such as scouting, emergency prepping, camping, and many others. Its capacity is 20 ounces of water, and you only need to squeeze it in order to drink. • It removes heavy metal, bacteria, protozoa, and other contaminants to give you safe drinking water. • The residual material that is pushed out by the S3’s foam may end up clogging the micro squeeze filter. When it comes to water filtration, you want to go with the most effective product. 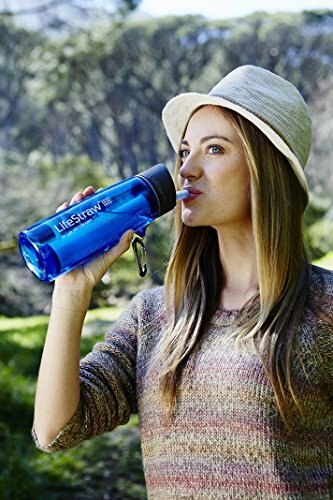 One of the most functional water filters is the LifeStraw Go Water Filter Bottle. This water bottle comes fitted with replaceable Lifestraw filters that effectively filter up to 1,000 liters (264 gallons) of water. What’s more, the bottle is leak proof, and you can use it as many times as you can. The only thing that has to be replaced is its filter medium. With a 0.2 micron, its contaminants removal ratings go beyond those stipulated by the EPA. It can eliminate 99.99999 percent of E. coli, oocysts, protozoa, and waterborne bacteria effectively. It features a food-grade flexible silicone mouthpiece, which is removable for easy cleaning. This bottle is also impressive because it leaves no aftertaste, and it does not rely on any chemicals to purify the water. • The bottle has a leak proof design, and it can be re-used indefinitely. • It can filter up to 264 gallons of water. • It gives the water a strong plastic taste. This water filter could not be omitted in this portable water filters review because it features an ergonomic design, and it is easy and safe to use. The filter bottle is made of 100 percent FDA-approved food grade materials, and it is recyclable. It has detachable components that make it easy to clean, while its carry loop enhances its portability. This filter bottle is also fitted with a locking dust cover flip, which enhances its design. The Nomad Water Filter Bottle also features a 40 percent larger straw that helps to increase its flow rate. It also has a silicon base, which increases its stability. You can rely on this bottle to provide clean drinking water because it also comes fitted with a hygienic bite valve. Moreover, it can eliminate 99.99 percent of tap water contaminants including heavy metals. It has 5-stage triple capacity filters with each producing 75 gallons of safe drinking water. 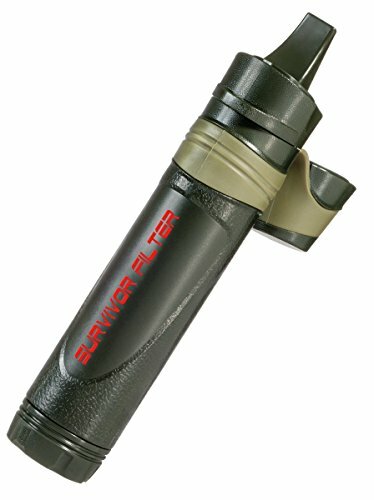 The Mini Water Filtration System from Sawyer is one of the best portable water filters that you can get in the market today. This water filter is the best for outdoor activities such as backpacking, hiking, and camping. It has an ergonomic design, and it can easily fit in the palm of your hand. It only weighs 2 ounces, which makes it easily portable. With a hollow fiber membrane and 0.1 Micron, the Mini Water Filtration System from Sawyer can effectively clean drinking water. 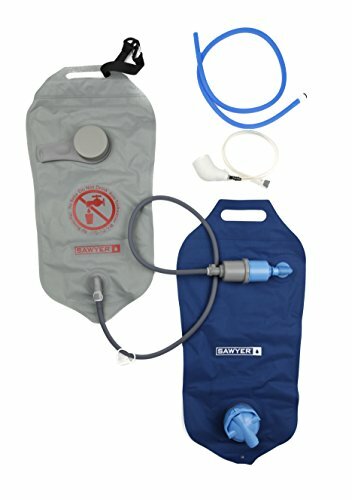 This water filter also features a 16-ounce drinking pouch that you can attach to in order to drink. Alternatively, you can attach it to hydration packs, standard disposable water bottles, or use the straw to drink directly from a water source. It removes 99.99999 percent of all bacteria and 99.9999 percent of all protozoa. Other features of the product include a cleaning plunger and a 7-inch drinking straw. Moreover, it can filter up to 100,000 gallons of water. • It is light and small for easy portability. • It does not seal properly with the squeeze bag after some use. If you are looking to accessorize your camping gear with a water filter, you might consider getting the Tohero Portable Personal Water Filter. This filter eliminates 99.9999 percent of all bacteria and 99.99 percent of all protozoa, eradicating the risk of waterborne diseases. It comes fitted with a filtering technology that does not use chlorine, iodine, chemicals, or activated carbon. The Tohero Portable Personal Water Filter uses hollow fiber UF Membrane to filter contaminants. It only weighs 2.29OZ and is fitted with a carabiner. You can use the water filter to drink directly from water sources such as rivers, streams, lakes, and dams. It can filter up to 264 gallons of water. 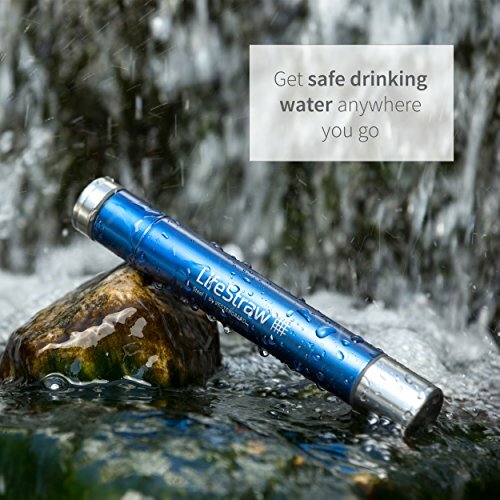 Another one of the most effective water filters is the LifeStraw Steel Personal Water Filter. The filter is made of stainless steel, and it has a 2-stage filtration system to remove contaminant efficiently s. The stainless steel is not only compact but also durable. Moreover, it is food-grade and meets the FDA standards for outdoor recreation. 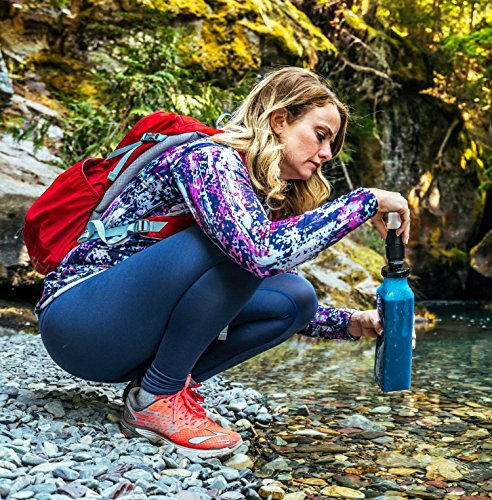 With a lightweight design, the LifeStraw Steel Personal Water Filter can filter up to 264 gallons of water. Interestingly, it does not need chemicals, pumping, or batteries to filter drinking water. This water filter filters up to 0.2 microns and can remove 99.9999 percent of bacteria and 99.9 percent of protozoa, results that go beyond the standards set by EPA. Another feature of this filter is a replaceable carbon capsule, which supports its 2-stage filtration process. • If it falls or is hit against a hard surface, its filtration mechanism may malfunction. • It does not filter heavy metals. At an affordable price, you can get this lightweight, portable water filter. The PointOne Squeeze Water Filter System features a hollow fiber membrane filter and 0.1 micron, which enhance its filtration mechanism. It removes 99.99999 percent of bacteria and 99.9999 percent of protozoa to give you safe drinking water. Apart from using it with the 16-ounce pouch that it comes with, you can also attach it to any standard water bottle. In order to drink, you have to squeeze it to spray water into your mouth or a bottle. It also features a built-in and removable push and pull cap. Moreover, the water filter includes a straw, two inline adapters for hydration pack bladders, a syringe filter cleaner, and BPA-free collapsible pouch. • Ideal for long hikes and camping trips. • Features a lightweight design. • Easy to use and requires minimal maintenance. • If the adapter gets unplugged, it is rendered useless. If you are looking for a lightweight portable water filter straw, you might want to consider the Portable Water Filter HuanLang 2000L Personal Water Purifier. It can filter up to 530 gallons of water, and it does not use chlorine, iodine, or any other harsh chemicals. It has a 3-stage filtration process that is made possible by its 0.1-micron hollow fiber membrane filter. This water filter is easy to use and is adaptable to a wide range of uses. 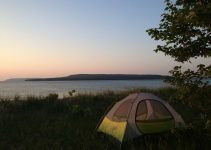 It is ideal for people that love outdoor recreation activities such as hiking and camping. It also comes with an extension straw, which you can connect to your bottle or water bag to drink the safe water. In addition, it comes with an 18-month warranty, metal buckle, user manual, and a lanyard. • If you do not wipe excess water from the filters and leave the plugs open to dry after use, the filter may end up being damaged. If you are looking for a good water filter, the Survivor filter may do you justice because it is proven to remove 99.9 percent of germs, bacteria, and staph. It can filter up to 26, 417 gallons of water through its membrane ultra filter, 265 gallons through its replaceable carbon filter, and 264 gallons through each of its cotton pre-filters (it has 5 extra cotton pre-filters). In order to take the clean and safe water, you are required to squeeze the canteens. You can use it directly from a water source or from a standard bottle. It produces up to 7 ounces of water per minute. Interestingly, it also comes with a lifetime warranty; its durability should be the least of your concerns. 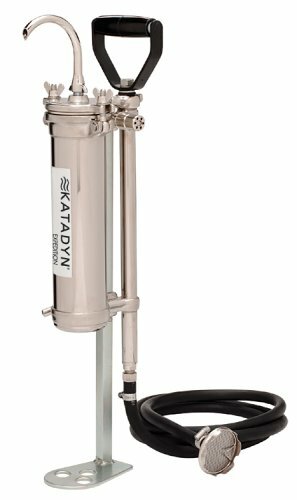 If you are traveling as a group, you might want to accessorize with the Katadyn KFT Expedition Water Filter. This is a high capacity system that can filter up to 26,000 gallons of water before it needs replacing. If you’re traveling in groups, this filter might also be effective as it has a flow rate of 1 gallon per minute. Besides it high flow rate, its filter material is silver-impregnated ceramic. This filter is not only durable but also comes with a 3-year manufacturer’s warranty. If you are on a camping retreat with your workmates, the Xpor Portable Dry Bag and Outdoor Hydration Pack is quite ideal to carry because it has a storage capacity of up to 25 liters. It filters water through its 0.1 micron with hollow fiber UF membrane. The filter is also covered with food-grade material to ensure that you only drink healthy and safe water. It has an ergonomic design built to look like a backpack with straps for easy portability. 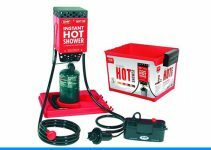 It also has an attached shower head that could help cool you down on long hikes. What’ more, it is easy to clean. • Can be used like a waterproof backpack, for easing fatigue, and to carry drinking water. • Filtration rate reduces after an extended use.